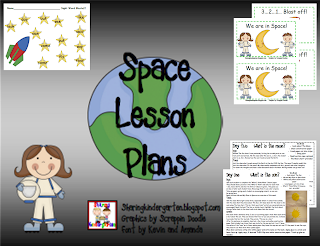 I have uploaded my Space Lesson Plans Plus Unit to TpT. You can go look at it here. It has 5 days of complete lesson plans with art projects every day. I made an emergent reader, several games and additional activities to add to it. My kids learned so much this week using these plans and had a BLAST! I have a simple freebie from this unit on my blog, so go visit and grab the writing activity. Wow! Cute! I sometimes end the year teaching about space. I'm off to look at your unit right now. Thanks for sharing!